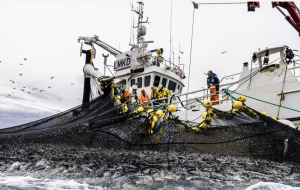 The International Council for the Exploration of the Seas (ICES) has advised an almost 40% reduction in catches of North Sea herring for 2019. Its recommended direct catch quota for 2019 is 291,040 metric tons; including bycatch on other species, 311,572t. Its advice for 2018 was 491,355t direct, and 517,891t total. The agreed-upon quota for 2018 was 600,588t in direct fishing alone. The fish mortality rate has been lower than the fishery's maximum sustainable yield since 1996, ICES noted. Although the stock size has been large, recruitment has been relatively low since 2002, and the two worst year classes in the last 30 years have occurred in the last four years. "The reason for the big decline is that there have been several very poor years in the spawning stock, which is likely to cause a relatively large decline in the size of the spawning stock of North Sea herring," said lead researcher on North Sea fisheries at Norway's Marine Institute, Cecilie Kvamme. ICES is also advising zero catches of Baltic Sea herring for 2019, which the institute noted would have a knock-on effect for North Sea stocks. The news comes after Norwegian vessels began landing North Sea herring for 2018 in the week commencing May 21, according to pelagic sales body Sildelaget. A grand total of 5,100t were registered; a low volume considering the efforts made, it said. Vessels report low fish concentration and very few “dots” available for sweeping. Sizes have varied; in northern areas the average weight was from 165-180 grams. From the fields further south, where normally herring for "matjes" (a specialty product in Scandinavia and northern Europe) is found, the average was from 123-160g. Buyers report the quality is not good enough for matjes yet, with fat content falling below requirements. Quality is expected to improve shortly. "[North Sea herring quota] is always linked to high interest in what will be the outcome; now the fishermen have seen less herring than previously," Sildelaget wrote. "Several vessels will head for the herring fisheries and buyers are prepared for production [week commencing May 28]. Hopefully there will be an improved concentration of herring, boosting the North Sea herring fisheries."